View multi-modality, multi-vendor images in a single desktop, including mammographs, DBT, general radiology exams and non-DICOM data. Decrease reading time and fatigue with industry-leading diagnostic tools, user-configurable protocols and automatic positioning and sizing for comparison of multiple modalities and priors. Improve diagnostic confidence with DBT support, computer-aided detection, cross-reference lines between suspicious areas on multiple views, and alerts for unread images. Move instantly from one study to the next using a smart pad or mouse. Whole breast ultrasound is commonly referred to as "ABUS" or "ABVS". This breast scanning technique that uses high-frequency sound waves to produce a 3D volumetric image of the entire breast allows radiologists to check the breast from multiple angles. The capability might reveal lesions that were invisible or difficult to find in 2D mammography. Whole breast ultrasound also has been shown to find small, invasive, node-negative cancers that were missed by mammography. The mammography module supports multi-modality, multi-vendor PACS, with consolidated image access on a single workstation. 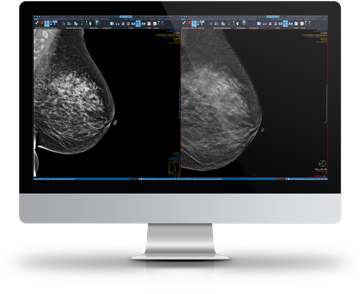 Screen and diagnose with confidence with our user-configurable intelligent display protocols for automated workflow, industry-leading mammography toolset, computer-aided detection (CAD) and optimized comparison of multiple priors. Streamline workflows, optimize comparisons, and enhance diagnostic confidence with a complete set of integrated tools for low-dose 3D mammography. The DBT module for Vue Mammo adds unique workflow capabilities and specialized tools that optimize the reading of digital breast tomosynthesis exams at the same time as other procedures. Breast imaging is an ever-evolving subspecialty that thrives on new scientific insights and technology development. Discover how the Clinical Collaboration Platform assists the fight against breast cancer with 3D tomosynthesis tools (DBT), whole breast ultrasound support (ABUS) and artificial intelligence - all in one.